Expression Engine (EE) has been one of the toughest competitor to other CMS like Joomla, Wordpress, Magento, Drupal and others. So, what makes EE so special? It's obvious you don't want your website to be limited at publishing or sharing content. You want it to be a system, a platform that offers mor than just content viewing and sharing, not just a blogging tool. It is not free. Just because it is not free does not make it less favorable. If the overall expenditure of other CMS is considered, none of them are free. EE has to be renewed annually. Even though the development team of EE is small, they are hyperactive and they offer considerable help through forums, blogs and other documentation. The control panel of EE is very innovative and it let you control things from the browser itself. Manage pages or do customization using such panel. EE is very secure, it offers IP banning, anti spamming methods. EE is very secure when it comes to CMS. Still lot of developers come to EE when developing a big website compared to smaller one’s. As they are cynical about EE not being a good option for developing small website. As mentioned above, one of the prime reasons why EE is very recognized CMS is because of the add-ons, extensions and plug-ins offered. Let's take a look at some of them, and see how they make EE more functional:- 1. FREEFORM (Free) Freefrom is used for each and every site developed in EE. The contact forms developed in EE are weak, so such add-ons can add the required functionality and create custom fields, templates and stored in the database to be accessed when needed. 2. File (Free) The image uploader of EE is decent, but it might be complicated for the end-user. It shows the HTML code and the user have to modify it, and many things can go wrong if the user is not experienced. So, such plug-in would let the user upload any image and FILE will take care of the HTML code in the templates. For blogs, where multiple images are required in the body, it might not work, but works great in any other application. 3. IMAGESIZER (Free Download) With this plug-in, the user can upload the file, change it, crop it multiple times with one simple tag. The CSS cropping only offers cropping from edge of the image. This plug-in would automatically create a new image based on the parameters. All the user has to do is specify the width and scale it down as per required. Best part, you can scale it anywhere on the image. With the file extension combination, the user can post everything in one place keeping the gallery untouched. 4. LG TWITTER (Free Download) Twitter_timeline is used to integrate the Twitter feed, but if you want to use twitter feed from EE and that to automatically whenever you submit new blog or a new entry. Here is the plug-in to do it for you. Customize the tweet every time a new blog is updated and let LGtwitter taker care of the posting. 5. MARKDOWN (Free Download) It is a great text to HTML file, that makes it easier to use the lists or header and any other HTML format to modify. The free download makes it even more desirable. 6. SHARE THIS (Free Download) To share the entry over the social media is made easy with this plug-in. If the user wants to share the post over social media or user can use it in conjunction with the EE’s tell a friend module, in which the module send an e-mail to every friend in the list about the post. 7. USER (Download for $89.95) With a very deep membership module, the customization of such module is not easy. The plugin offered by Solspace takes care of the out of the box information you want to share and display it in any way you want. Yes, the plugin cost a bit, but if you want your members to update their profiles, and add other data, without logging into the control panel then this is the option. I guess that pretty much does it, when it comes ad-ons offered by EE. Such plug-ins can be life savers in the time of need so, please use them when you are stuck. The add-on section of the Expression Engine offers the search of such add-ons, so choose the right one Also, you can visit SOLSPACE or LEEVI GRAHAM websites, they offer tons of ad-ons that can do wonders for you. We have tried to include some core ad-ons, but still there are many other. So, if you think of any other ad-ons, that can be vital for EE, do let us know in the comment section below. Expression Engine conference will take place from October 5-7, 2014 in Alexandra, Virginia. Such conference is a boon for the ones who are looking to enhance their knowledge on Expression Engine. Visit www.expressionengineconference.com/ for more details about the conference, the venue and the programs offered. 22 pioneers in the field of Expression Engine development will share there valuable insight and give necessary suggestions. 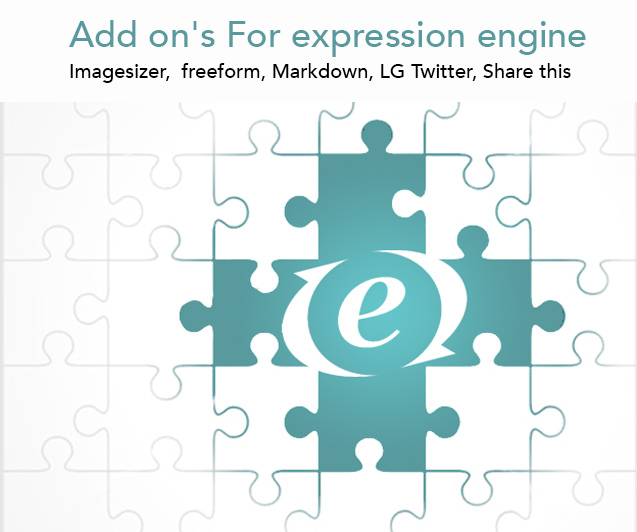 Such conference is a boon for the one’s who are looking to know more about Expression Engine. We are proud to state that ZealousWeb is one of the proud sponsor of such grand event. To know more about the details of conference, packages, schedules or to register, please follow the above mentioned link and have one of a life time experience.